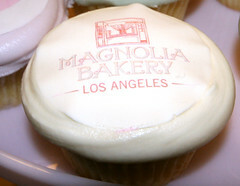 In July, when Magnolia Bakery opened its first (but surely not its last) Los Angeles outpost, I was weary of the hype, fueled by local cupcake fanatics as much as by any PR firm. The breathless chronicling of Magnolia's search for a location, the problems inherent in dealing with L.A.'s bureaucratic fiefdoms, the curative powers of their red velvet. After all that, the cupcakes, while terrific, are hardly my favorite thing about Magnolia. What keeps me coming back is their stable of baked goods. Unlike some one-note bakeries that are in for a cruel corrective when the cupcake trend peaks -- it will peak, won't it? -- Magnolia offers a cornucopia of treats, only a few of which I've outright disliked (the caramel cake, the S'mores cupcake). These desserts -- turn the page -- won't broker world peace or keep Florence Henderson on "Dancing With The Stars," but they do make me happy. 1. Chocolate Ice Box Pie: If someone reverse-engineered Oreos, stripping them of their repugnant cream filling and transforming the dried husks of cookie into soft cake then spackled together layers of the stuff with a lightweight cream frosting, it would taste something like this i.e. delicious. 2. Banana Pudding: Slices of fresh banana and soft hunks of cake mingle amid dense, silky cream. 3. Peanut Butter Ice Box Pie: Another velvety dessert. Every bite seems to be infused with the flavor of a dozen condensed Reese's Cups. 4. Blueberry Cobbler: The hard crumbly topping on their cobbler more closely resembles a coffee cake than a traditional cobbler, something I've always fantasized about doing. 5. Lemon Bars: Not too tart. Not too sweet. And just the right height.